An easy-to-follow DVD for mastering 8 blues gems. 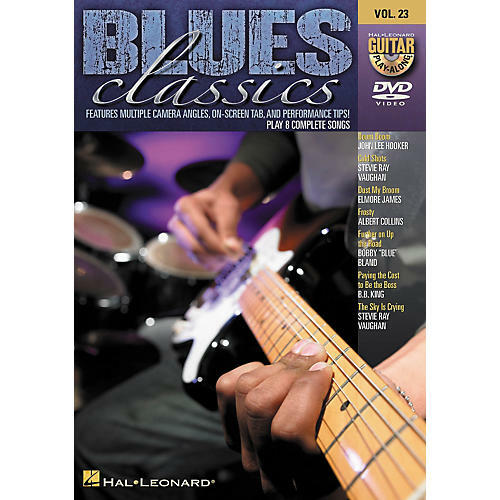 The Blues Classics - Guitar Play-Along DVD, Volume 23 lets you hear and see how to play 8 blues classics like never before. Just watch, listen and learn! Each song starts with a lesson from a professional guitar teacher. Then, the teacher performs the complete song along with professionally recorded backing tracks. You can choose to turn the guitar off if you want to play along, or leave the guitar in the mix to hear how it should sound. You can also choose from three viewing options: fret hand with tab, wide view with tab, pick & fret hands close-up. Each DVD includes great songs that all guitarists will want to know! "Paying The Cost To Be The Boss"
Got the blues? Or want to learn how to play them? Here's a great DVD to do so. Order now!